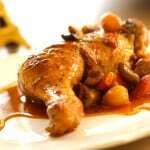 You are here: Home / French Recipes / Coq Au Vin Recipe You Can Make Ahead! 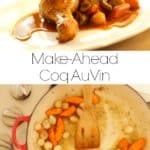 Coq Au Vin Recipe You Can Make Ahead! 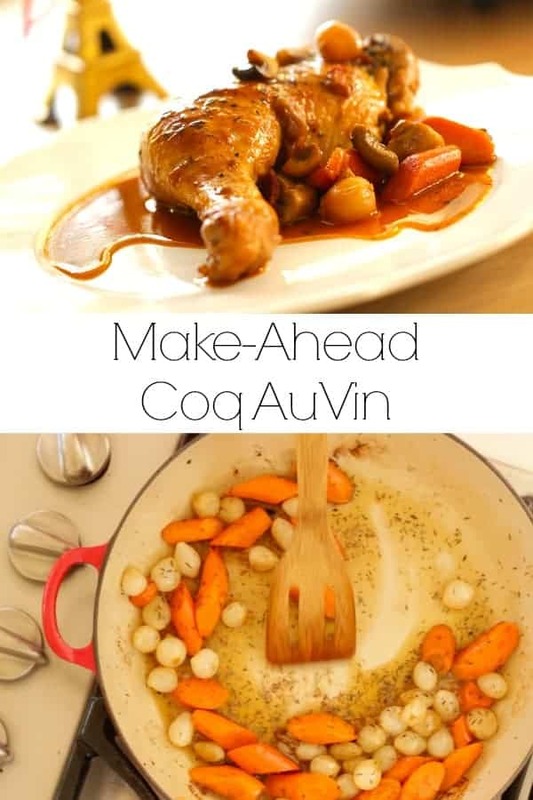 Learn how to make my delicious make ahead Coq Au Vin recipe in time for holiday entertaining! (Special Thanks to Swanson Chicken Broth for sponsoring this episode). Christmas dinner can be a stressful ordeal! Between the holiday chaos of last-minute shopping, the gift wrapping and baking, we all need a recipe that is both elegant but simple! And if it can be made the day before even better! 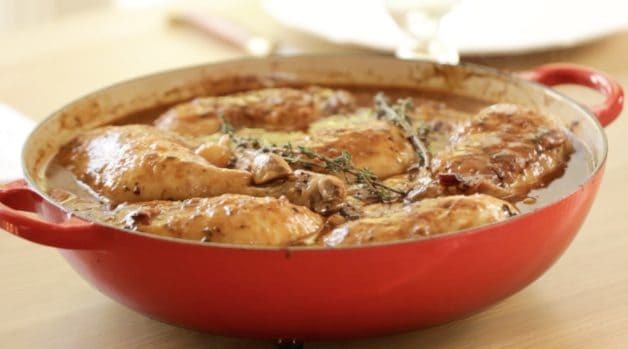 Watch my Coq Au Vin Video Demo Below! The literal translation of Coq Au Vin is rooster in wine. 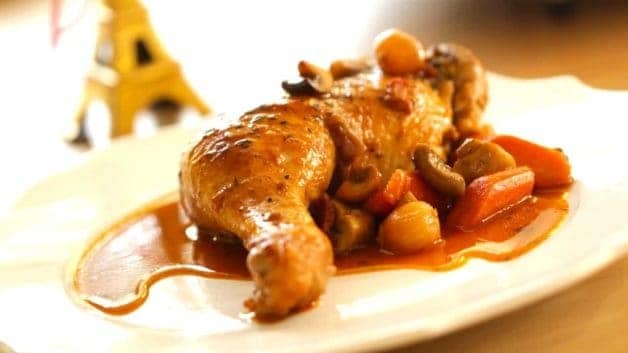 This is a classic French dish that was made by slow cooking a tough rooster in wine until tender and juicy. Today we don’t cook with a lot of roosters here in the States! So chicken is a great substitute. For a chicken coq au vin, I really like to use Chicken legs. I find they are the most flavorful part of the chicken, and look elegant on the plate. 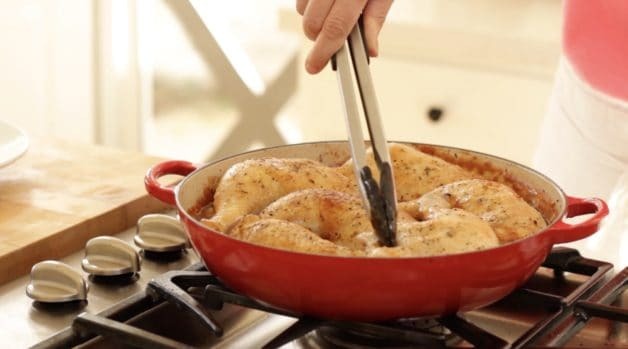 I also like to make this dish in a Le Creuset Braiser 6 chicken legs fit perfectly in the 3.75 quart size. I’ll warn you it is pricy! But worth it in my opinion since this is an heirloom piece that will last for decades. They actually get better with age! What to Serve with Coq Au Vin? 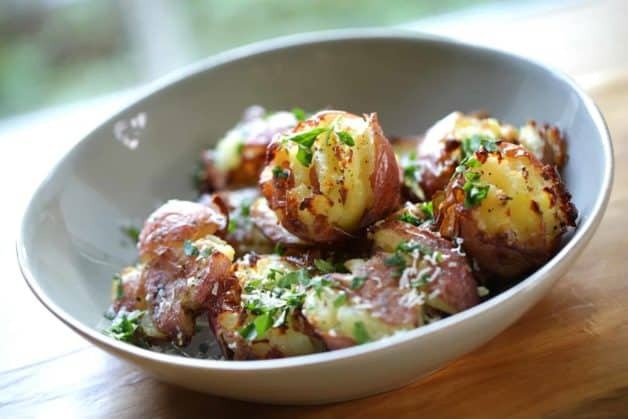 I think any kind of potato dish pairs beautifully with Coq Au Vin. You want some kind of starch to lap up all the delicious sauce with. 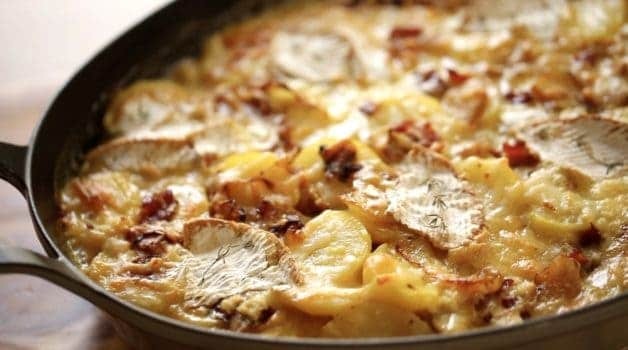 Or for something a bit more decadent you could also try my Tartiflette recipe. What Wine is Best For Coq Au Vin? Some of my favorite wines for Coq Au Vin include a Cotes du Rhone or a Pinot Noir or even a Merlot would be OK. My rule of thumb is use what you would drink. Or follow the $10 rule, any wine over that amount will be better than those under it. Unless you are shopping at Trader Joes where I’ve found some fantastic reds for under $10! Such as the Perrin Cotes du Rhone. How to Make Coq Au Vin Ahead of Time? For a make-ahead Coq Au Vin, complete the recipe all the way through, eliminating the final thyme sprig garnish on top. To reheat, add about 1/4 cup of chicken broth to “loosen” the sauce a bit which would have thickened over night in the fridge. Then place in a 300F oven with the lid on for 20 mins. Spoon the sauce over the chicken, and then garnish with fresh thyme sprigs on top. 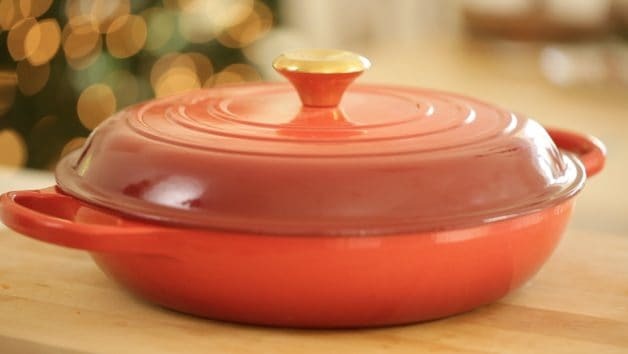 Serve oven to table! Follow us on Youtube, Pinterest, Instagram, Facebook & Twitter! 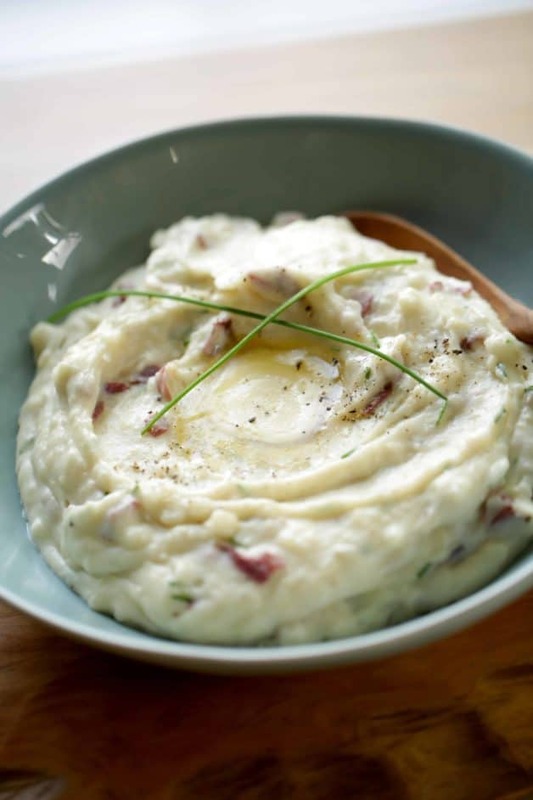 In a large Dutch oven or oven safe casserole with a lid, melt butter and sauté bacon. 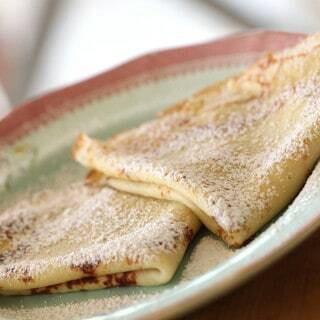 Once crispy, transfer with a slotted spoon to a plate lined with paper towel. Leave fat in pan. 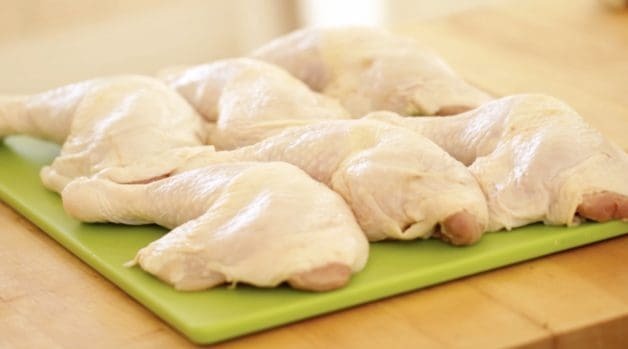 Season chicken legs on both sides with salt and pepper to taste. In the bacon fat, brown chicken, on both sides. Transfer to a plate to rest. In the chicken fat, sauté carrots and onions until browned and tender. Add ½ tsp of dried thyme. Turn off flame while adding alcohol. Add cognac and wine, stir. Turn flame back on. Add chicken broth. Add garlic, tomato paste, bay leaf, and salt. Stir to combine. Add 3 dashes of Worcestershire Sauce. Create a “slurry” by combining 2 tbsp of cornstarch with 2 tbsp of water, mix to combine. Bring the pot up to a boil, and then add the slurry, this will allow the sauce to thicken. Then lower to a simmer. Add back in the bacon. Place the chicken, skin side up, back into the pot. Place lid on top. Bake at 350F for 25 mins. Meanwhile sauté mushrooms in butter until browned. At the 25 min mark, add mushrooms. Cover and bake for another 20 mins. Then remove lid, garnish with fresh thyme, and bring to the table! 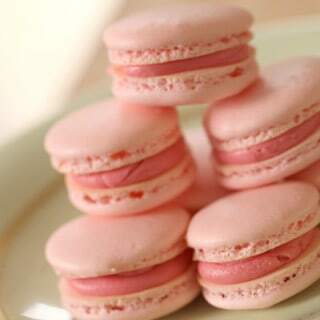 Serve with a mashed potato puree or crusty French bread. 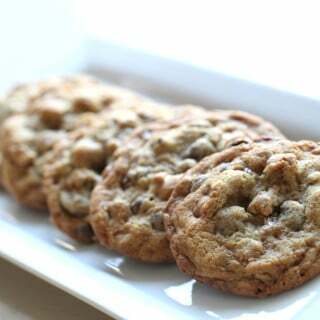 If making this the day ahead cool completely, and refrigerate, covered. Before reheating, add a splash of chicken broth to loosen sauce and cover and heat at 300F for 20 mins. 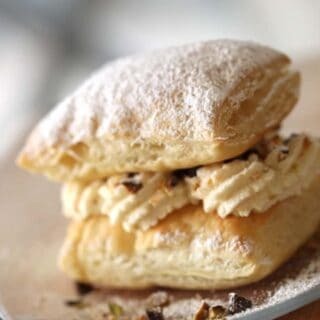 Previous Post: « The Best Apple Pie-10 Foolproof Tips!